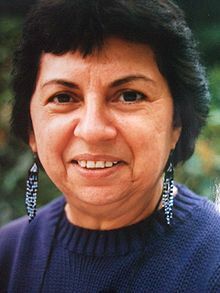 Gloria Anzaldúa was born Sept. 26, 1942, in the Rio Grande Valley of Texas, and died Oct. 4, 2004. Her 1987 book, Borderlands/La Frontera, is considered a landmark book in Chicano and feminist studies. Anzaldúa worked the fields with her family as a child growing up in South Texas. She received her bachelor’s degree at Pan American University and her master’s and doctorate at the University of Texas at Austin. A collection of her essays, poetry and other works is compiled into The Gloria Anzaldúa Reader. Here’s a terrific profile of her from Ms. Magazine.